We stand as witnesses to this historic moment when the federal and provincial governments, RCMP, and Coastal GasLink/Transcanada are openly violating Wet’suwet’en, Canadian law, and international law. Coastal GasLink/Transcanada is proposing a 670-kilometer fracked gas pipeline that would carry fracked gas from Dawson Creek, B.C. to the coastal town of Kitimat, where LNG Canada’s processing plant would be located. LNG Canada is the single largest private investment in Canadian history. 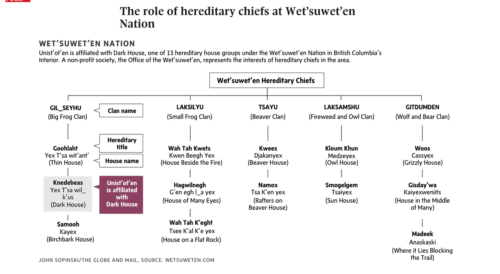 Each clan within the Wet’suwet’en Nation have full jurisdiction under their law to control access to their territory. 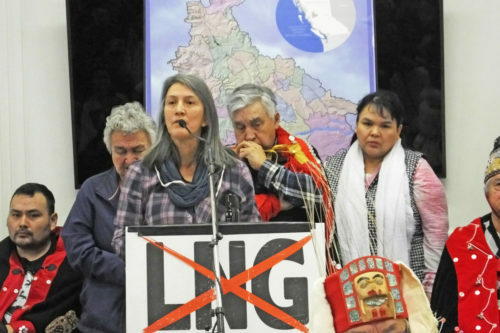 Under ‘Anuc niwh’it’en (Wet’suwet’en law) all five clans of the Wet’suwet’en have unanimously opposed all pipeline proposals and have not provided free, prior, and informed consent to Coastal Gaslink/ TransCanada to do work on Wet’suwet’en lands. The Wet’suwet’en Access point on Gidimt’en territory has been calling for international actions in solidarity. “This is not over. We are living out our laws on our lands. 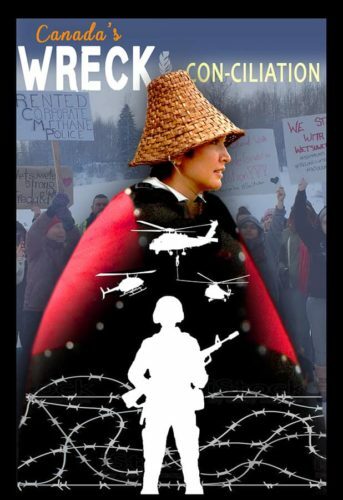 We are Wet’suwet’en Strong. Stand with us.” On Tues Jan 8, an unprecedented outpouring of support took place in over 70 cities around the world. Actions and events in support are continuing. 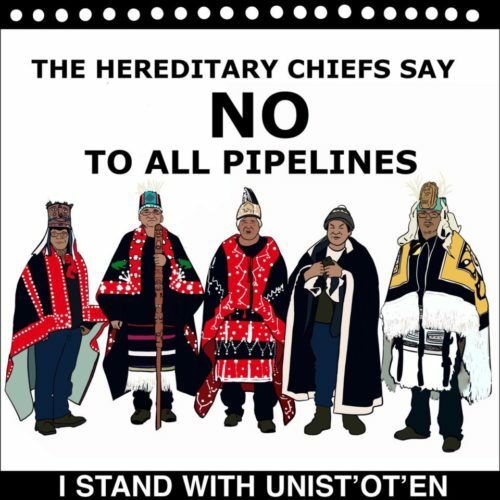 Find one near you, or organize one in accordance with the action protocols of the Wet’suwet’en Access point on Gidimt’en territory, by joining the “We Support the Unist’ot’en and the Wet’suwet’en Grassroots Movement” facebook group. Send AN EMAIL DIRECTLY to the provincial government of British Columbia and the federal government of Canada to respect the rights, jurisdiction, and laws of the Wet’suwet’en on their unceded territories. Flood the Lines! Take one minute to make a call to the relevant provincial and federal Ministers. This link will connect you directly to their phone lines and there is a sample script. In, B.C. CLICK HERE AND REST OF CANADA HERE. Join hundreds of organizations and 13,843 individuals in SIGNING THE PLEDGE to support Unist’ot’en and the Wet’suwet’en. Download, print and distribute our SOLIDARITY LEAFLET widely. DOWNLOAD and PRINT the “Heal the People, Heal the Land” zine. Sign up for Unist’ot’en Camp Newsletter. 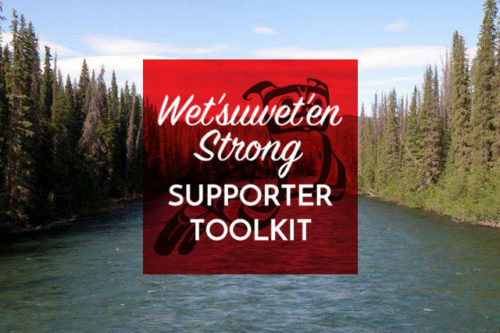 If you are part of a labour union, academic department, or community group, organize to get a statement in support of Wet’suwet’en jurisdiction and governance. Read a growing list of SOLIDARITY STATEMENTS from Indigenous nations, labour unions, faith groups, community groups, environmental NGO’s, musicians, and university departments. Canada versus First Nations: Whose land is it anyway? Understanding the history of First Nations governance. Informational update on Wet’suwet’en defence of their lands and waters. 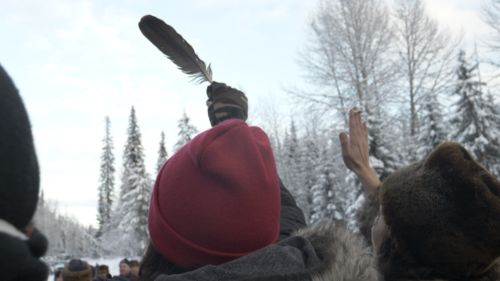 An Injunction Against the Unist’ot’en Camp: An embodiment of healing faces eviction. Nine Things You Need to Know. 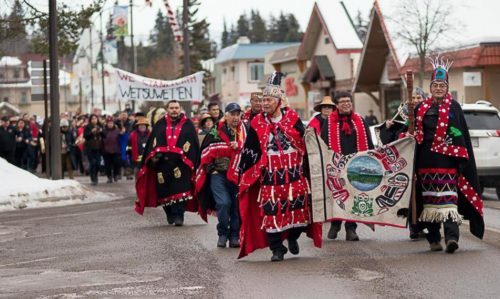 At the core of the Wet’suwet’en conflict: How should resource development be governed? Corporations don’t seem to understand Indigenous jurisdiction. The Wet’suwet’en and B.C.’s gas-pipeline battle: A guide to the story so far. When Indigenous Assert Rights, Canada Sends Militarized Police. Canada knows that its own actions are illegal. The Wet’suwet’en fought for many years in the Delgamuukw-Gisday’wa court case to have their sovereignty affirmed by Canadian law. 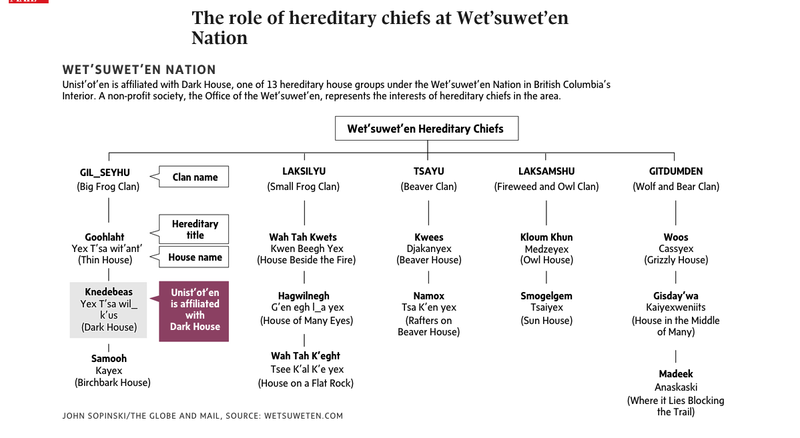 In 1997, the Supreme Court of Canada ruled that the Wet’suwet’en people, as represented by their hereditary leaders, had not given up rights and title to 22,000 square kilometers of Northern British Columbia. The Unist’ot’en stand-off: How Canada’s “prove-it” mentality undermines reconciliation. Law is on the side of Indigenous group in pipeline dispute, say legal experts. The Unist’ot’en Movement, Not the RCMP, Has the Law on Its Side. Injunctions: What Land Protectors Need To Know. UBC Faculty of Law on Canadian Law on Aboriginal and Treaty Rights. Making Space for Indigenous Law. The TransCanada Coastal GasLink pipeline would run approximately 670 kilometres across Northern B.C. It is part of a recently-approved $40 billion fracked gas project LNG Canada that is the single largest private sector investment in Canadian history. LNG Canada is a fracked gas processing facility run by five companies, of which Royal Dutch Shell is a 40% owner. The NDP provincial government announced tax breaks for this LNG project even though the biggest driver of climate change in the province over the coming decades will be from the LNG industry. Fracking injects vast amounts of freshwater combined with sand and 750 chemicals into drill sites to break up hard shale formations and release trapped gas below the ground. Fracking also causes large amounts of methane to escape into the atmosphere, which has a serious impact on our climate and public health. Alberta’s tar sands is the top consumer of fracked gas in Canada, accounting for one-quarter of the fracked gas used. Coastal GasLink pipeline permitted through illegal process, lawsuit contends. How BC’s Gas Giveaway Fuels Alberta’s Oilsands. LNG-sized gap in B.C.’s climate plan raises questions about government’s priorities. LNG Canada: Short-term politics trumps long-term climate responsibility. A Clear Look at BC LNG: Energy security, environmental implications and economic potential. Booklet on Coastal Gaslink Pipeline, Fracking, and the Health of B.C.